When the word “wearable” is mentioned, mixed notions of its meaning arise amongst the general population. 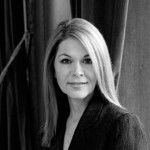 It is fairly safe to say that the term wearable is not a commonly used expression outside of the CyberTherapy community. However, few understand that a very high percentage of the world’s population use wearable technology everyday. In fact, wearables have been in use since the 1500s when a familiar and well-known device – the pocket watch – was invented. Since then, technology has expanded with the invention of the wristwatch, blood sugar monitors, intelligent textiles, health monitoring systems – and the list goes on. As technology has been revolutionized, wearables and their many uses have sprung up, reflecting improved ways of reinventing healthcare and well-being. The term “wearables”, in its most basic form, denotes a computer worn on the exterior of the body. However, the meaning of the term has broadened to technology worn on the body, which is generally focused on health and healthcare issues amongst the medical community. What was once just a matter of attaching a watch to a wrist has blossomed into a welcomed new application for the medical and technological worlds, and this modern innovation can be used in areas such as behavioral health, monitoring, media development, and other information technology. Also referred to as “wearable computing”, researchers have made headway in areas of study such as augmented reality, pattern recognition, body temperature control, applications for disabilities, applications for the elderly, user interface design, electronic textiles, as well as even fashion design. With a constant interaction between the user and the computer, an “on/off” switch does not exist, allowing for continuous monitoring for research with little to no interruption of the user’s everyday lifestyle. 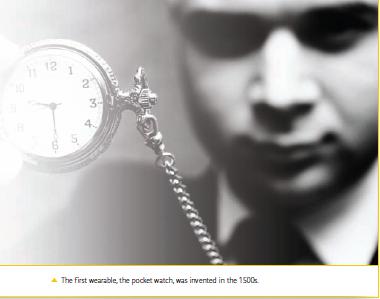 The first wearable was invented in the 1500s with the invention of the pocket watch. However, modern wearables have only come into existence in the last century, with vast improvements even in the last decade. Though some attempts to create wearable technology occurred in the 1960s, the most notable wearable computing began in the 1980s with allpurpose wearables. The First International Symposium on Wearable Computers: Digest of Papers, IEEE Society credits Steve Mann with the first general-purpose wearable technology – he invented the backpack- mounted CMOS 6502 microprocessor- based computer that controlled cameras and flash bulbs. Mann would later invent the Wearable Wireless Webcam in 1994, which greatly influenced wearables and wearable research. A head-mounted display by Private Eye instigated further research and improvements for head-mounted displays (HMDs) in 1989; however, universities such as MIT (“Tin Lizzy” wearable computer design), Columbia University (KARMA: Knowledgebased Augmented Reality for Maintenance Assistance), and the University of Toronto (the “wrist-computer”) made drastic improvements and additions to the wearable world in the early 1990s. DARPA (Defense Advanced Research Projects Agency), a U.S. agency responsible for the development of military technology, began the Smart Modules Program to develop wearable technology for commercial use. Today, the latest research and modern 7 technology is being developed and showcased at international technology and healthcare conferences such as IEEE, SIGGRAPH, and CyberTherapy & CyberPsychology conferences. Commercial technology companies have realized the possibilities of these wearables and have attempted to commercialize different wearable computers for the masses. Though some attempts did not popularize, the wristwatch with a GPS system wearable, probably the most popular and commercialized wearable, has become mainstream for campers, runners, and travelers. Current projects that have risen on the wearable community radar are focusing on reinventing different and innovative uses for wearable technology. These projects are among some of the most groundbreaking uses of wearables on the market today. Fabrican has created a spray-on, non-woven garment to create unique clothing that attaches itself to the body or the garments beneath, creating a one-of-a-kind technology-based clothing that can be created to fit the user’s mood and creativity. The company has also begun exploring medical possibilities with the “fabric’s” potential as an adhesive for new types of patches, wound healing products, dressings, and slow release systems, among others. Dr. Manel Torres, who bases his operations out of Imperial College London, describes his products as “novel concepts [that] enlighten major worldwide manufacturers as to the huge potential which exists, through the successful branding of a product range.” Fabrican states that their “underlying ethos is to produce concept products, which are market leaders, through scientific research and development for a futuristic market” (www.fabricanltd.com). An MIT-based team of scientists has created “Graspables,” which are built around the idea that technology and wearables should not be complicated or user-unfriendly. “Graspables” have achieved a technology that is considered smart enough to understand what the user expects “based on the many physical cues that people automatically give when they simply pick up a device” (Boston.com). The “wearable” can achieve this adaption by sensing the type of grasp of the device itself by the user. With a familiar “bar of soap” appearance, “Graspables” are able to predict the user’s intent and automatically morph into predicted modes such as a cell phone, camera, or remote control. This product is able to react and even predict the user’s actions and thus has an incredible potential for the commercial world. The technology reacts to the user’s fingers and their grip on the surface of the product. Graspable technology is already finding its way into the sports and medicinal realms, considering its capability to enhance and mold itself to fit the user instead or vice versa. The medical world has indeed taken wearables to a new level: instead of just using technology for creative or commercial purposes, it has taken advantage of the possibilities of this technology to monitor human action, body temperature, and even administer medication when needed. The U.S.-based IsisBiopolymer has created a “wearable” technology called the Isis Patch, that is a “personalized, single-use, flexible, ultra-thin, transdermal drug delivery (“TDD”) patch…which will allow medical professionals, for the first time, to accurately control transdermal drug delivery” (isisbio – polymer.com). This product has the ability to ensure drug administration that is both reliable and effective over an extended period of time without a nurse or doctor having to physically be with the patient. The founders of the Isis Patch describe their break-through technology as expanding the possibilities for similar products (much like nicotine or hormone-based patches) to applications for pain management, cancer treatments, neurology, chronic and acute illnesses, as well as diabetic medications. Design News describes the technology as a “Band-Aid like” patch, which is .002 inches thick. Prominent researchers are convinced that the Isis Patch will revolutionize the way medicine is delivered. After researching and discovering the multitude of wearable computing innovations, one can’t help but wonder if wearables can be completely positive, practical, beneficial, and hold the potential to revolutionize medicinal and technological applications. Despite these incredible applications, when in use, can they practically aid the user, whether it is medicinally or for general purposes, or will wearables become an added burden? Objectively, I’ve put together some key points, on the possible “downsides” of wearable to determine their practical uses for the general population. Are wearables practical? Designers would argue that this is the purpose of having computer technology attached to the user, so that s/he will have access to the technology at any point at which the user decides. This argument is quite true and wearable technology serves its purpose well – but at what cost? How affordable can a mobile medication reminder or advanced multi-media watch be for the general public? Can smell-technology incorporated into garments become affordable? Obviously, new technology will initially come at a high price. However, once perfected and commercialized, the product has the ability to become more affordable for the general public. GPS watches, which are probably one of the most commercialized modern wearables, are currently being sold for $250 – $400 per watch, which is expensive, but you can certainly spend more on a traditional top-of-the-line watch. It is a fact that with most new technologies, the price will remain higher than an average product due to their connection to other technologies. Take, for example, the same GPS watch as previously mentioned. In order for the technology to function, the wearable relies on a satellite circling the globe, tracking the system to inform the user of their location. The company who produces these watches must have satellite-launching capabilities or must partner with a company who has them. The same process coincides with medicinal wearables as well, as monitoring technology must rely on third-party technology to relay messages back and forth between the two users. Products that rely on third party technology will consistently remain at a higher price than other technology- based products. As the GPS watch example shows, some wearables can be used without effort, effectively appearing to be a part of clothing or even a simpler wearable. However, when certain technology becomes larger, odd-shaped, or even serving as an adhesive to the body, it may cause difficulty in the practicality of actually wearing the wearable. Fabrican’s spray-on technology is incredibly inventive, but is it completely “wearable”? Would you feel comfortable spraying on your clothes while performing activities that might induce perspiration like jogging, cleaning your house, or helping a friend move? The sheer possibility that an object could easily rip would hinder my decision in a similar situation. Obviously, this spray-on technology is meant for a higher fashion realm and to be used with other traditional garments as well, but, for all intents and purposes, these are clothing substitutes and must be treated as such. On the other hand, Fabrican’s technology holds a high probability of success in medicinal treatments for pain management, etc. as well as finding applications in the automotive, design, and hygiene fields of study. Other technology such as the “No Contact Jacket” from No Contact, which uses a highly electric-stimulated material to shock an uninvited attacker to the point of losing muscle control, has been designed with a woman’s protection in mind. The idea behind this particular wearable is to protect the user, yet such a jacket has the potential to do more harm than good. Indeed, this is effectively a wearable taser-gun that could just as easily injure an innocent bystander as it could an actual attacker. With such a design, the question of “wear-ability” arises as well as whether or not a wearable has a plausible possibility of success in an everyday environment. Although there are a few downsides to wearable technology, in most cases, it seems to be a very relevant, practical, affordable, and “wearable” concept. Many wearables have been commercialized: they are quickly becoming more affordable and improvements are being made to original models. In the next decade, I predict that wearables will become a common and well-used household product amongst the general population, and this will only enhance our daily and medicinal lives. So where would you go to find the newest wearables and wearable research studies? International conferences such as SIGGRAPH, IEEE, and the CyberTherapy & CyberPsychology conferences would be at the top of your list. Corporations and medical technology businesses are watching closely for the newest study to be unfolded at these conferences. This groundbreaking addition to the technological and medical field has already been able to enhance the user’s life and will continue to support improved quality of life. Wearables have been introduced to us, providing a technology to better our lives, and time will tell the magnitude of the effect that this concept will have on the future of technology – a future that no doubt will be beyond our imaginations.